By the turn of the 19th century Mound Bayou, MS was a bustling town located in the heart of the Mississippi Delta. Founded by Isaiah T. Montgomery in 1887, Mount Bayou became a show piece for African-American enterprise. At a time when African Americans faced the possibility of death for just trying to vote, residents of Mound Bayou were founding banks, opening restaurants, grocery stores, building homes and serving in various capacities as duly elected officials. African American’s also owned large amounts of land and plantations in this fertile, delta rich area around Mound Bayou which they also leased to tenant farmers who raised cotton, rice, and their families. Walter “Yank” Simmons, the grandfather of Dr. Ollye B. Shirley, was one of those landowners. United States Senator Blanche Kelso Bruce was his neighbor. 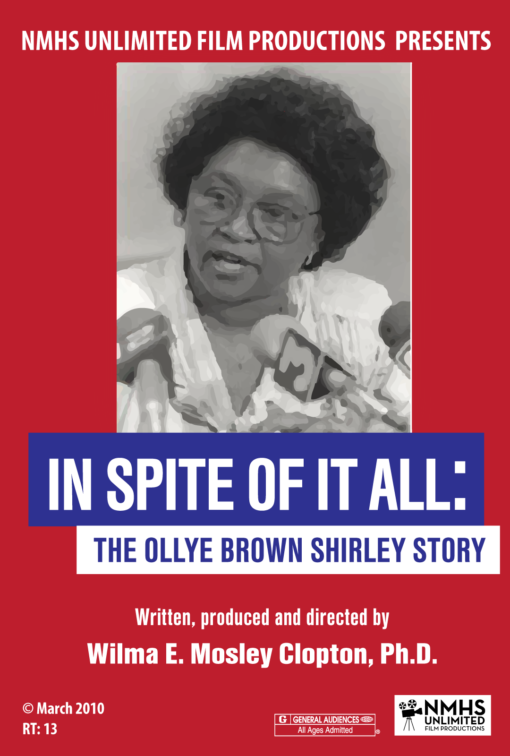 “In Spite of it All” is the story of how Dr. Shirley transformed these early experiences into action. Her activities as an activist brought the Electric Company and Sesame Street to the Children’s Television Network in Mississippi and twelve other states in the southwest. As president of the school board, Dr. Shirley also had a transforming affect on the Jackson Public School System. In Spite of it All from Wilma Clopton on Vimeo.